I so enjoyed making these that I decided to make myself a pair. This is the start of NHM #8 from Selbuvotter (NHM stands for Norwegian History Museum). What drew me most to this design above all the others is the way the pattern comes together at the finger tips. You’ll see it ere long! The palm, too, is refreshingly different to the last pair I made. It is referred to as the Holy Trinity motif, which I rather like and find festively pertinent! You see that up-and-down dotty band going around the cuff? It’s often called the dancing ants motif and that, too, had an influence on my choosing the design! Dancing ants is just too funny a mental image to pass up on knitting it. On a completely different note, something that has been really floating my boat today is the book Doodle Stitching. Check out the project gallery over on flickr. 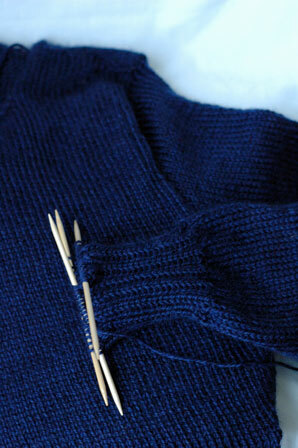 On Thursday afternoon, I got stuck into my dad’s jumper which has been lying in wait for sleeves for a while now. Once I got the sleeve cap done, it flew along quickly enough. Over the next day or two I hope to finish the other one. Technically I am under a deadline for this one, since in our family we exchange presents on Christmas Eve (a big Scandinavian tradition I found out this week!). To the casual passer-by, this probably doesn’t mean very much since Christmas is Christmas, but to have to present the jumper on Christmas Eve instead of Christmas Day cuts out about twelve hours of knitting time if it does come down to the wire. Anyway, I hope that by getting it done early I will avoid any such scenario. 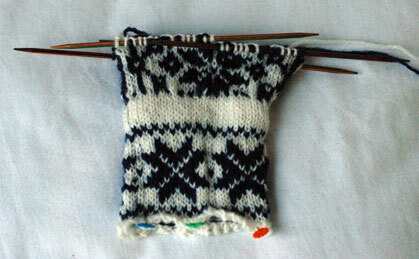 Now that the home strait is in sight, I am already contemplating another pair of mittens. I love my snail mittens but (dare I say it) sometimes the alpaca is that bit too warm sometimes. Hello again! Apologies for the prolonged absence but things suddenly got very, very busy. For a start, I was travelling up and down to rehearsals with the Moysingers in Ballina over the last two weeks. Then we had our Christmas concerts in Belleek Castle last Sunday and Monday. It all went really well! Now that it’s over, it’s time to get down to business: mittens. I started these last October (while I was travelling up and down to rehearsals, funnily enough) and only finished them last night. 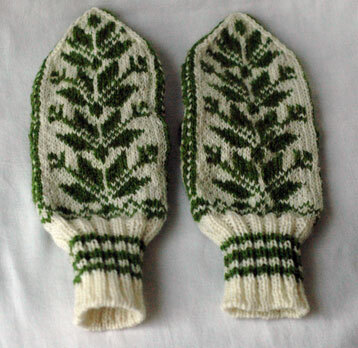 Well, I had the main mittens done and all they lacked were thumbs and some weaving in. Pattern: NHM #3 from ‘Selbuvotter‘. Yarn: Brown Sheep Nature Spun sport weight (that’s DK to you and I), 100% wool. 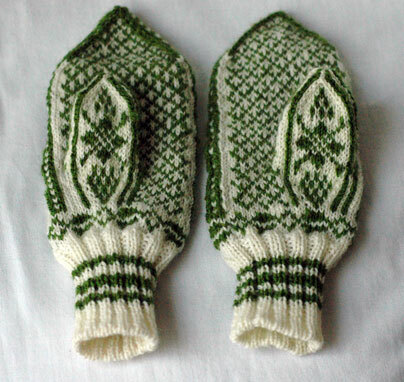 They are going to my sister in the States (cutting it fine, yes I know, thank you) who knows that she is getting mittens. She rang me up as I was half way through a beret in Louisa Harding’s Hulda (more on that another day) and I asked her, would you prefer a beret or a pair of mittens for Christmas? She said, the wind chill factor is minus 25 today, I think mittens would be more useful to me than a beret! So, she’s getting the mittens. I love the thumb pattern! The thumbs were not the easiest to do. 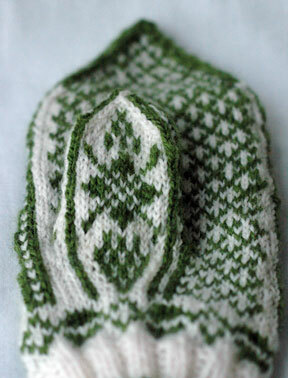 The pattern on the front was as straight forward as the rest of it, as there were stitches on hold to continue it on. The pattern for the back of the thumb wasn’t at all because you have to pick up stitches from a cast on edge over the gusset. It took me a few gos to get it absolutely seamless with the pattern on the palm but I think it was worth it. 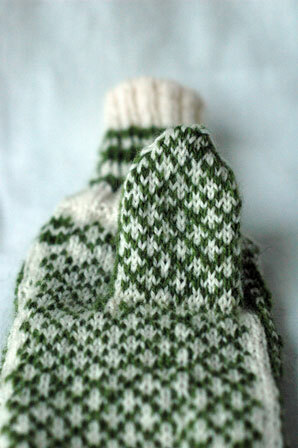 In the end, I reknit the entire right thumb to match the left thumb exactly. 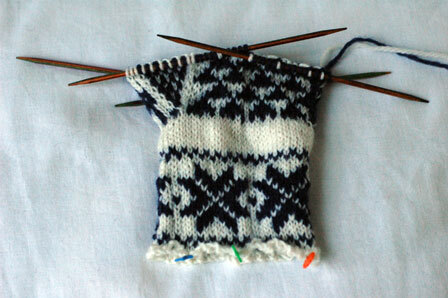 I have two and two-third sleeves to knit before next Wednesday. The two-thirds can wait (and probably will) until Christmas Day or Stephen’s Day… but the other two sleeves both belong to the same jumper and really do need to be knit, since I don’t think my Dad enjoys wearing vests! If anyone has some spare elves knocking around, please send them my way….